Fast forward to current day and “normality”, I can’t help but think about how we have lost that ability that children have to simply believe. And how, so often even when we do want to dream big we have people around us, the naysayers who tell us to “be realistic” and to downscale our dreams and not be “so ambitious”. I don’t blame the naysayers, most of the time they actually think they are helping by directing you to a safe route and they usually want the best for you. I firmly believe that if your dream isn’t a little bit ambitious or doesn’t make you feel a tad bit uncomfortable, then it’s probably because you are playing it safe and limiting yourself. Even stretching a little out of your comfort zone is how you grow and truly live. 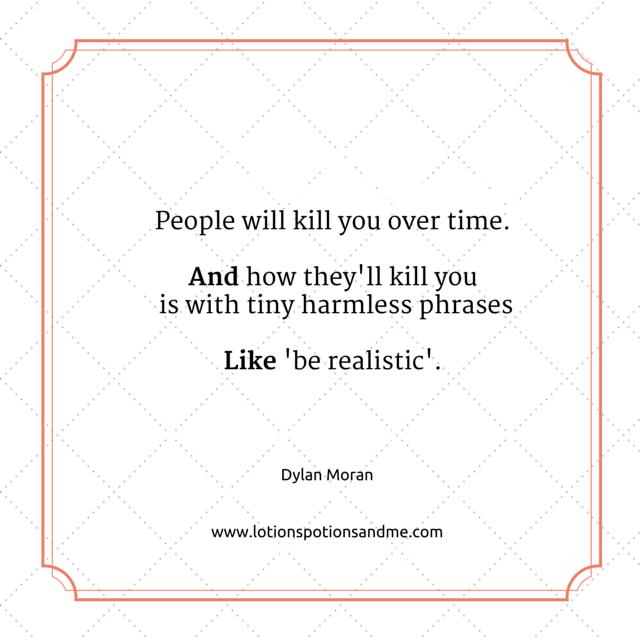 Remember that the word “realistic” is relative and most times only relevant to the person who is saying it. Everyone can have a different perspective of exactly how far they can go. So pause and ask yourself the question. What would I do if I didn’t think I could fail? And regardless of what you are trying to do, my little encouragement for today is to dream a little harder and go for a little bit more.